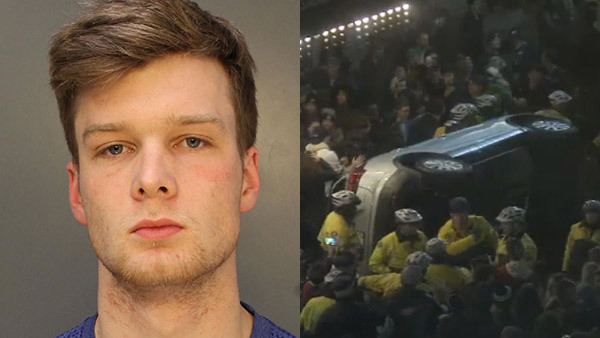 PHILADELPHIA (WPVI) -- Police have arrested a 20-year-old man for damaging a vehicle while celebrating the Philadelphia Eagles Super Bowl victory Sunday night. Philadelphia police say the suspect, identified as John Rigsby of Malvern, Pa., was among a group of seven individuals who flipped a 2017 Nissan Rogue SUV onto its driver's side door, causing dents and scratches. The incident was caught on camera around 11 p.m. Sunday on the 1400 block of Walnut Street in Center City. On Tuesday, Rigsby was arrested and charged with Vandalism and related charges.